Robbie Palacios, left, sits in position beside a tree while Lizeth Serna films him while Naomi Adape, standing, holds a leaf blower Saturday at Cenizo Park in Edinburg. EDINBURG — When there’s just 24 hours to produce a three- to five-minute digital film, every second counts. Among the 11 teams competing in this year’s 24-Hour Film Dash sponsored by the CineSol Film Festival, 14 students from the Edinburg school district audio video production program were among the competitors determined to meet the deadline for a short film that will make its debut this weekend, along with other festival entrants. In its 10th year, the dash brings together amateur and professional local teams in a competition for the contest’s grand prize, the Estrella award. The Edinburg team, made up of high school students ranging from sophomores to seniors, was led by senior Adelina “Andie” Sanchez, who was chosen as director of the film. 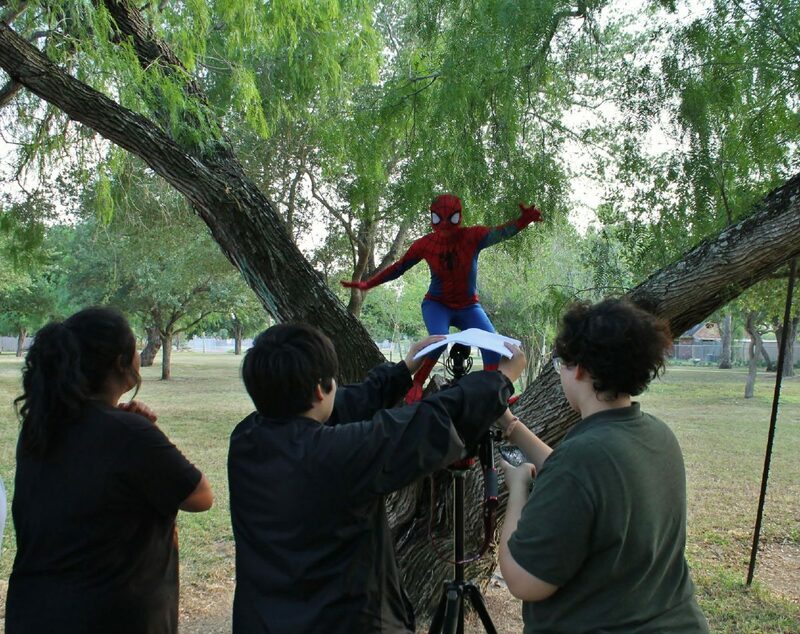 Adelina Sanchez, left, directs Isela Menchaca, dressed as Spiderman, in an outdoor scene Saturday as Naomi Adape, center, and Grayson Hernandez, right, adjust the camera settings at Cenizo Park in Edinburg. Emiliano Ramos, left, and Jacqueline Calvillo sit in position before filming a scene Saturday at the career and technical education audio video production studio at South Middle School in Edinburg. 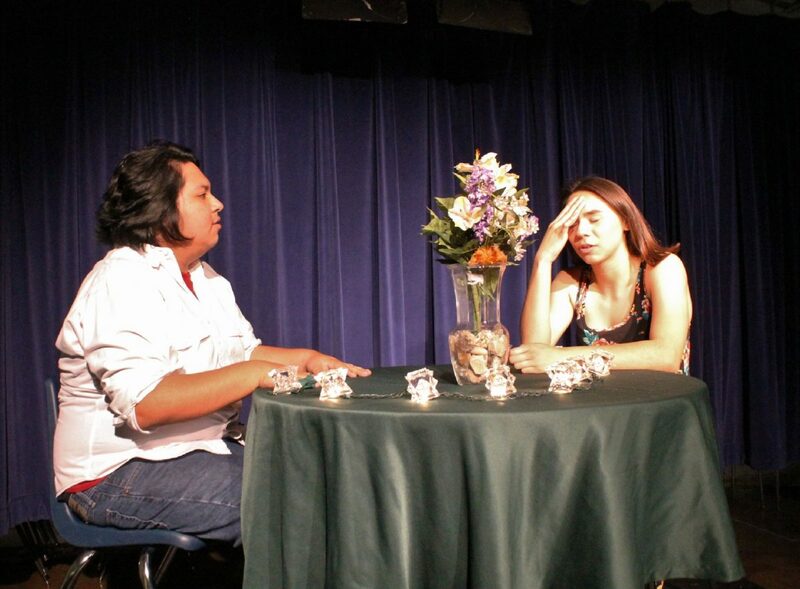 The competition began this past Saturday at the Cine El Rey Theater in McAllen. There, contest officials met to go over the contest requirements and synchronize their watches as the competition kicked off. Each year, specific elements, such as required props, themes and characters are required to be included in the film. Requirements for filmmakers included working in a “cosplayer” character, a Slip N’ Slide for a prop, the line “I used to be indecisive, now I’m not sure,” and the throwing of a chancla (sandal). The prescribed overall theme this year is fake news. Armed with the final set of requirements, the team returned to their school studio to begin the creative process, mapping out the storyline, assigning duties and coordinating props and locations. The team, in order to make better use of the limited time, split into two groups — one to shoot outdoor scenes and the other indoor scenes. With little time for planning once the final elements were revealed, the team had to be flexible, adapting and making changes as the production progressed. Sometimes spontaneous jokes during a scene are incorporated, if it works for the film, he said. Susan Smith, instructor for the audio video, or AV program, said each student knew their strengths and weaknesses as they prepared for the film dash. Smith explained that team captains are given a list with members’ names to be ranked between one and 11. “We take the list and make a table and they highlight first and second choice,” Smith said. Once filming was completed in the evening, attention turned to the editing, music placement and voice-overs. This work continued through the night. The teams had to turn in their finished projects, complete with credits, on Sunday morning. A team of three judges were tasked with choosing the winners, which will be revealed during a screening of the entrants at 6 p.m. Sunday at Cine El Rey. This year’s panel of judges are Evelyn Castellano Escamilla, an Emmy-nominated producer and journalist and CEO of Verve Media; Clay Williams, news personality and former KGBT-TV sports director; and DJ Alvaro (Alvaro Sanchez), program and music director for Ultra 104.9 FM. This coming Sunday, CineSol Film Festival will hold the screening and results of all the films produced by the teams at Cine El Rey, located 311 S. 17th St. in McAllen.